London i-Venture Card: FREE Access to View from the Shard, Hop-On, Hop-Off Tour, Dining Options and More! Plan your London trip in your own way with the London i-Venture Card. This handy pass covers all the major attractions of this vibrant city and offers a fantastic way to save money while on vacation with your family and caters to everyone’s need. You get free entry ticket to some of the most famous London attractions. But what makes this pass stand out is that there are also theatre and dining options included! You can see one of the world-famous West End shows or enjoy dinner at one of London’s best-loved restaurants. 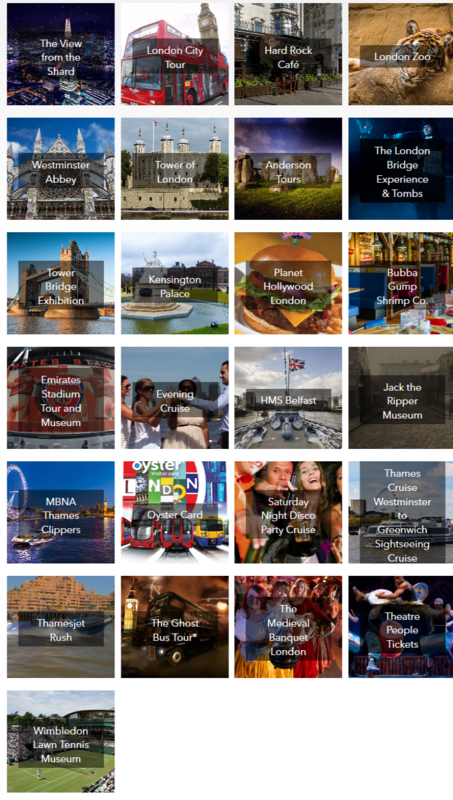 Select either a 3, 5, 7 or 10-attraction flexi pass that grants you free tickets to London’s top sights and choose any combination among popular attractions and save money. The pass is redeemable for a period of six months from the date of purchase and is valid for a month, once you start using it. Your London Flexi Pass gives you free access to some of the top sites in London. You have an option of selecting 3, 5, 7 and 10 attraction tickets as per option selected, which includes attractions, theatre shows, day tours and dining experiences in London and surrounding areas. The tickets will be redeemable for period of one month. The London Flexi Attractions Pass voucher must be collected within 6 months of date of purchase and pass will be valid for 1 month from the date of issuance. Both the passes allow you to plan your sightseeing as per your convenience without any time constraints. Choose any combination among popular attractions. Tours and Excursions:London City Tour – 5 day unlimited hop on hop off bus tour, The Ghost Bus Tour, See London by Night Bus Tour, Full day tour Leeds Castle, Canterbury and Dove, Full day Oxford, Stratford and Warwick Castle tour, Full day excursion to Bicester Shopping Village, Full day Windsor, Oxford and Stonehenge and Full day Salisbury, Lacock and Bath. Theatre: Choose from available shows including the 39 Steps, War Horse, Mamma Mia and many more. Guests can upgrade to tier A shows. Dining: Hard Rock Café, Bubba Gump Shrimp Company, Tattershall Castle, Planet Hollywood.